Students enrolled in this program earn a Diploma in Marketing. The program is designed for students whose career plans include product management, sales management, marketing management, advertising management and marketing research. Further, it prepares students for higher studies in marketing or business. To enhance students’ critical thinking, and to develop their analytical, problem-solving and decision-making skills. To provide a broad understanding of the marketing function and its significance to the health and survival of any organization. To provide an introduction to the marketing system, its foundations and institutions and expose students to product, promotion, price and distribution decision areas. To offer a comprehensive study of the basic concepts of marketing operations and strategic planning. 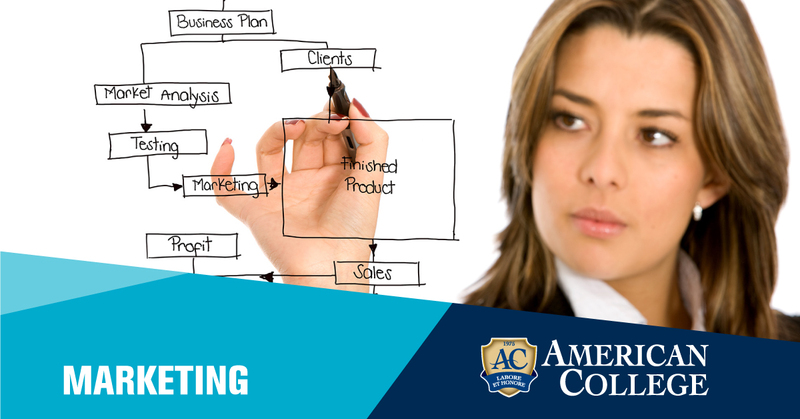 To equip students with the ability to formulate, implement and monitor a basic marketing plan. To offer students a solid academic background that would enable them to pursue higher studies in undergraduate and professional schools. Identify core notions of marketing and the role of marketing in business and society and recognize the valuing process as it relates to making optimal decisions in the domestic and global business environments. Identify and take advantage of marketing opportunities and establish the optimum marketing mix for a business. Develop a market research plan and prepare market and business forecasts for applying a marketing plan. Identify market research needs and implement a marketing plan to meet an organization’s objectives, and to improve marketing performance, and evaluate and plan e-marketing communication as part of the integrated marketing communications plan.